1. The clouds in Xinjiang fell to the ground! The truck drivers are afraid to move forward (due to the water vapor in the cloud being too heavy). This natural phenomenon is very rare in Xinjiang and Tibet. It is very rare! An interesting video in circulation online purports to show amazingly huge Clouds Falling on Ground in China as a truck driver halts and watches it. What you see in the video is real, but as explained below, they are not Clouds Falling on Ground in China. The video in question also appeared on YouTube with other descriptions like it shows a mysterious large Cloud sitting completely still on the roads. It is circulating online since at least 2016 and many viewers wondered what it really is, and whether it is real or some computer animation. Some suggested the weight of the huge cloud is so much that it fell to the ground, as a rare occurrence. However, the claim is too good to believe, as you can see clear difference in color of the clouds in sky. Not clouds falling on ground or animated film, the video in fact shows a massive Sandstorm in China. Couple of Chinese Television media also showed the video of rare natural phenomenon and called it a Sandstorm. Some viewers questioned whether it is moving or completely still. The Sandstorm is indeed starting to move at slow pace, and at one point in video you can also hear the noise of it in background. According a July 2016 report on ViralNova website viralnova.com, the crew of a big rig truck were transporting a large piece of machinery somewhere in desert part of China. They came across the massive sandstorm, so instead of driving through it or turning around, they stopped, got out, and shot some video. 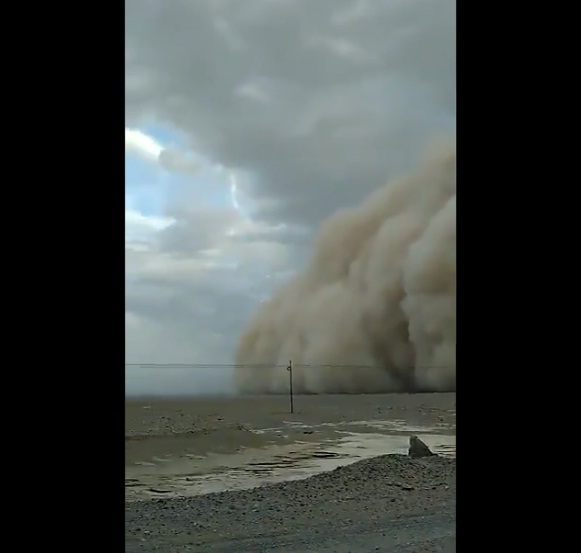 If you are still not convinced, shown below is somewhat similar Sandstorm engulfing Kashi Prefecture in China’s Xinjiang in May 2017. So, the claim that the video shows huge Clouds falling on Ground in China is a hoax. What are the Differences Between Sandstorms, Dust Storms and Haboobs?